Maybe you live with a spouse or a child who grinds their teeth while sleeping, and now you just view this as “normal.” While it may seem “normal” to you because you’ve gotten used to hearing all that grinding, it’s really not “normal” and it can cause a lot of harm to the teeth and jaws of the grinder. 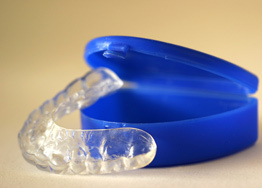 A night guard can protect you from the serious effects of teeth grinding. However, the good news is – there is something you can do to prevent nocturnal (night) grinding and the damage it causes and those of us at Douglas E. Oliver, DDS are here to help you. If you are concerned about a loved one’s teeth grinding, or a loved one is concerned about yours, give us a call and we will be happy to discuss affordable solutions with you! Teeth grinding, also known as bruxism, occurs most often while sleeping, when a person slides their upper and lower teeth back and forth over each other. Some people also grind their teeth in the daytime, usually because of a misalignment between their top and bottom teeth. No one really knows why people grind their teeth, but stress, underlying anger issues, and anxiety are considered the most likely causes in adults. In children, teeth grinding may have more to do with how their teeth are erupting and the fact that their top and bottom teeth don’t fit together well. However, they may also grind as a reaction to teething or earache pain or because of stress. Not only can grinding damage your teeth by cracking or chipping them or wearing them down, it can also affect your jaw and cause facial and headache pain. Not a very pleasant list now, is it? And, if you have had any kind of reconstructive, cosmetic or restorative procedures done, such as bonding or crowns, you risk causing significant damage to a hefty investment you may have already made in your teeth! Our office can fit you with a special mouth guard to wear while sleeping. A night guard is made by taking impressions of your upper and lower teeth, using a special mold. The impressions are used to make the mouth guard so that it fits perfectly to the shape of your teeth. The night guard doesn’t stop the grinding, it just makes sure that it doesn’t affect your teeth! If grinding is a problem for you or a loved one, Douglas E. Oliver, DDS has the solution. Please call our office for an appointment to be evaluated and fitted for a night guard. Don’t let teeth grinding become a bigger pain than it already is! What's Dry Mouth All About?